“New Music for a New Year: Music from the North Woods,” a festival of three unique concerts will take January 19th and 20th. 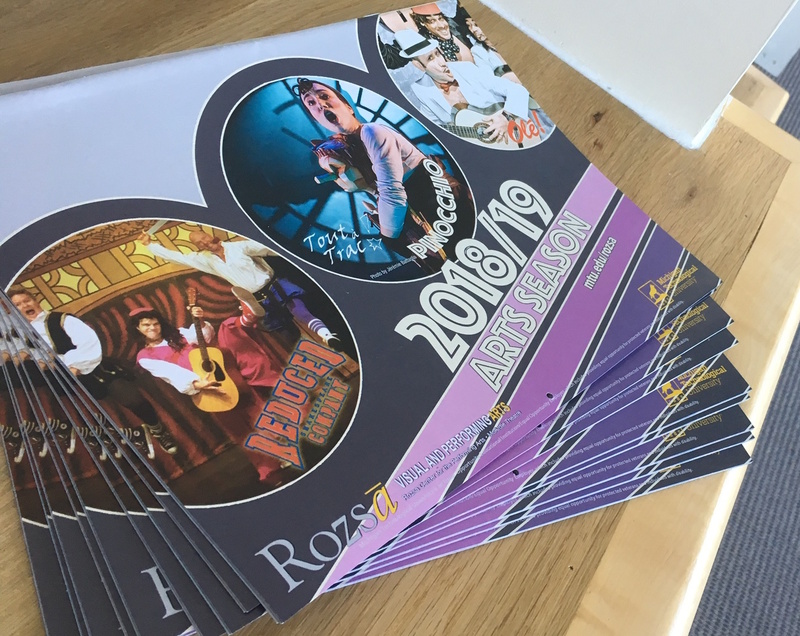 The event is presented by the Rozsa Center for the Performing Arts, the Department of Visual and Performing Arts and Libby Meyer (VPA) director of the Music Composition Program. The festival is a series of concerts of contemporary music written by composers either from or who have lived in the Upper Peninsula. The concerts feature Houghton native Elena Ruehr, composer and award-winning faculty member at MIT. 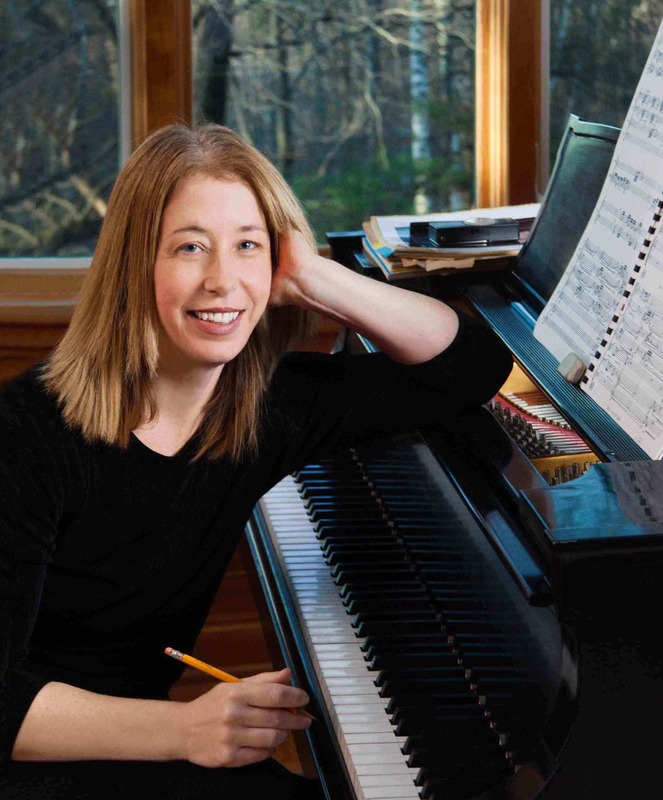 There will be a Master Class presented by Ruehr at 3 p.m. January 19th in the McArdle Theatre in the Walker Arts and Humanities Center, featuring a recital of music by student composers. The festival continues that evening with an intimate evening “Backstage” performance at 7:30 PM in the Rozsa Center, featuring the music of Evan Premo, Libby Meyer, Thomas LaVoy, Abbie Burt Betinis, Carrie Biolo, Patrick Booth, Christopher Plummer and featuring Elena Ruehr’s Third String Quartet. The final concert will take place at 3 p.m. January 20th in the McArdle Theatre with music by Griffin Candey, Josh Loar, Sarah Rimkus, Milton Olsson, Stephen Rush and featuring the piece “Lucy” by Ruehr. The Upper Peninsula has produced and inspired many talented composers and performers. “New Music for a New Year” will feature a number of these composers whose work is as diverse and beautiful as the landscape that inspired them. The concert will feature the Superior String Alliance String Quartet, ConScience Chamber Singers, and two works by Ruehr performed by her Third String Quartet (Saturday) and “Lucy” (January 20th) a work which will feature ConcertCue, a web application developed at MIT for streaming synchronized program notes during a live musical performance. Meyer’s interest in natural soundscapes, conservation of special places and curiosity about the relationship between the arts and the natural world fuel her work. She is a co-founder of the Keweenaw Soundscape Project established to aurally document the Keweenaw region and surrounding lands for ecological, social and artistic value, has served as an Artist in Residence at Isle Royale National Park and has written a number of compositions inspired by the landscape. Note the Saturday matinee concert is free. Tickets for the Saturday evening and Sunday New Music for a New Year festival concerts are on sale now. Tickets are $15 General Admission, $5 for youth and no charge for Michigan Tech students with the Experience Tech fee. Tickets are available by phone at 487-2073, online, in person at the Central Ticketing Office in the SDC or at door before the performance. 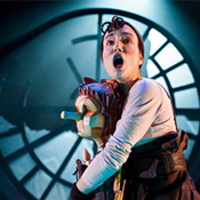 The box office opens approximately one hour prior to performances. Michigan Tech choir members in front of a statue of Nelson Mandela, South Africa, May 2017. The Michigan Tech Concert Choir, along with friends and family, spent two weeks sharing their music with the people of South Africa. What they received in return, was life changing. 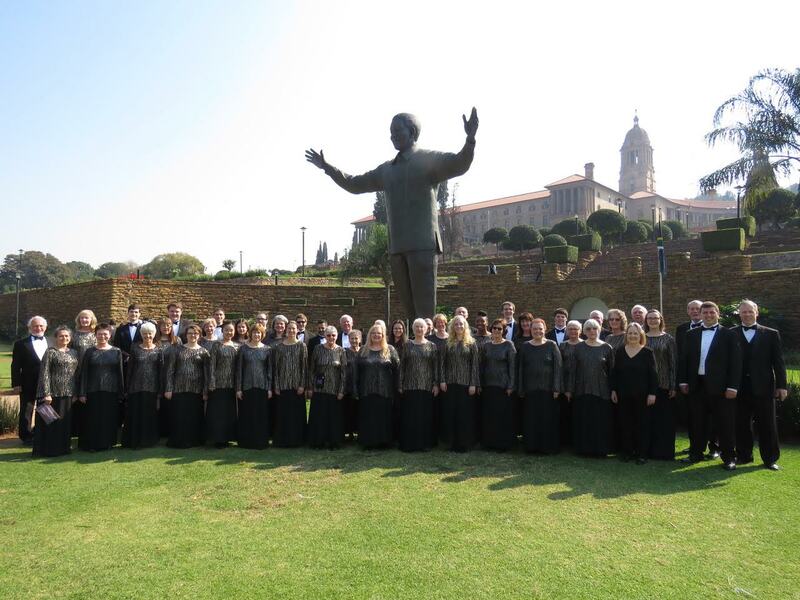 In May, 45 members of the choir, along with 29 guests, embarked on a two-week concert tour of South Africa. The group traveled to Chicago on May 2 and boarded a plane the following day for the 25-hour trip to Pretoria. In addition to concert stops in Pretoria, Johannesburg, Soweto and Cape Town, the they spent three nights in the African countryside at the Cradle Moon Safari Lodge. The group ranged in age from 14 to 87 and included 12 current Michigan Tech students and 19 current or retired faculty/staff members among the singers. The group performed a total of five concerts; at the University of Pretoria, Holy Cross Anglican Church in Soweto, Hillbrow Theatre in Johannesburg, Old Apostolic Church in Khayelitsha (Cape Town) and Phandulawazi High School, Mitchell’s Plain (Cape Town). In addition to the concerts, the choir participated in two church services and five choral workshops and exchanges with local choirs. 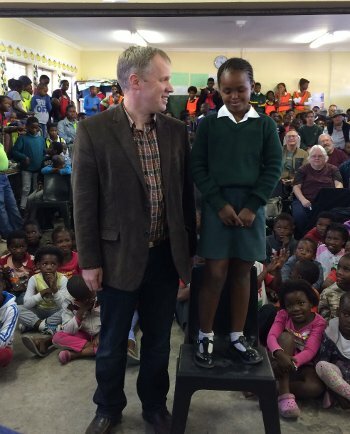 Michigan Tech Concert Choir Director Jared Anderson poses with a new friend during a visit to a South African school. The choir spent two weeks in South Africa in May. 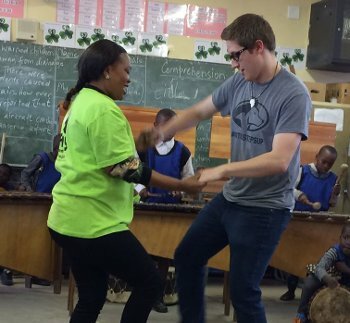 Michigan Tech student Spencer Carlson learns some moves during the Michigan Tech Concert Choir’s tour of South Africa in May. “I can’t remember concert experiences that were more varied and exciting for our singers. The choirs that we collaborated with welcomed us with open arms and warm hearts. The choir will never forget the experience of singing side by side with people who sing with such spirit,” says Anderson. Scott Sviland was impressed by the audience participation. “It was there from the first song on,” the chemical engineering major from Escanaba says. “It was in these moments where you really see how reserved American audiences are compared to audiences in South Africa.” Sviland says this was especially true when the Tech choir would sing a South African piece. Anderson said each choir tour ends up being an incredible adventure, but there was something special about South Africa. Formed in 1980, the Michigan Tech Concert Choir is made up of Michigan Tech students, faculty, staff, retirees and community members. Since its inception, international touring has been an important part of the Concert Choir experience. To date, the choir has toured and performed in Mexico, Central Europe, Eastern Europe, Brazil, Argentina, Chile, Russia, Dalmatia, China, and now South Africa. Lisa Gordillo, Assistant Professor, Visual and Performing Arts, presents a new collection of sculpture and installation at the Centro Cultural Efrain Recinos in Quetzaltenango, Guatemala, July 15-Aug. 1. 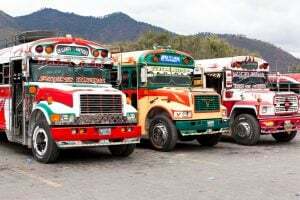 The exhibit, titled “Prohibido Orinar Aqui,” was developed from Gordillo’s spring exhibit, “ChickenBus,” in the Rozsa Gallery. The works of art in the exhibit are inspired by US-Guatemalan relations. Gordillo is also sculptor-in-residence at Tierra Adentro, the International Poetry Festival of Aguacatan, Guatemala. This year’s festival is dedicated to immigrants and displaced people. Gordillo will create an art installation, titled “Caminante” (Someone Walking) along the Aguacatan river and a migrating book as part of the festival. 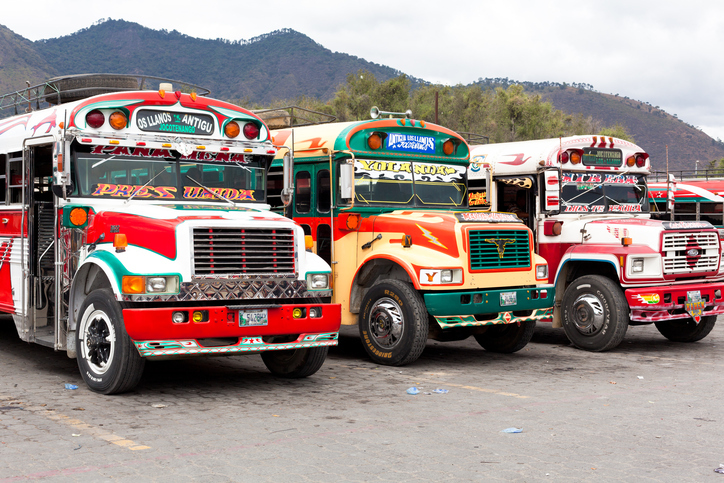 Antigua – Guatemala – January 24, 2013: Traditional Guatemalan local “Chicken Bus” station in Antigua, Guatemala. It is located behind the busy street market in Antigua.